As an experienced Eugene kids’ dentist, Dr. Rita Feldmanis and our compassionate team of oral health professionals at Feldmanis Family Dentistry believe that dental care should start at a young age in order to ensure a lifetime of healthy teeth. While it’s easy to think of baby teeth as temporary, a child’s oral health at a young age greatly influences the long-term development that can significantly impact the health of a child’s smile for a lifetime. Baby teeth act like placeholders that help to guide permanent teeth into the correct position. When a child loses their baby teeth at too young an age, their permanent teeth can form crooked, crowded, or misaligned. This could require the need for orthodontic treatment to correct, or it could lead to a lifetime of poor oral health and difficulty eating, speaking, and talking if left untreated. Fortunately, by providing your child with the care of an experienced kids’ dentist in Eugene at a young age, you can help to protect the health and beauty of your child’s smile. We understand that parents can have a lot of questions when it comes to their child’s first dental appointment. With that in mind, here are a few answers to some of the many questions that parents have about bringing their children to the dentist. The American Academy of Pediatric Dentistry recommends that a parent schedule their child’s first dental appointment by the age of 1, or within six months of the first tooth eruption. However, if you have concerns about your child’s oral health development, Dr. Feldmanis recommends you schedule an appointment earlier if needed. This initial visit will provide your child with the opportunity to become accustomed to our staff and office in a relaxed and stress-free environment. We want you and your child to become comfortable, so if treatment is ever needed, our team can make your child’s first dental experience a positive one. Can I accompany my child back to the treatment area during the appointment? Absolutely! While some children tend to behave better without a parent in the room, others require the kind, comforting face of mom or dad to feel relaxed. We respect your decision on what would make you and your child most comfortable and are happy to accommodate the needs of your family. Dr. Feldmanis strives to make a child’s first appointment as comfortable as possible. The first visit will begin with an overall review of your child’s current oral health. Dr. Feldmanis will examine your child’s medical records, allow him or her to meet our staff, tour the office, take a seat in the treatment chair, and encourage your child to have as much fun as possible. If your child appears comfortable, Dr. Feldmanis will conduct a comprehensive dental examination to assess the current state of the patient’s oral health development. Dr. Feldmanis will also happily answer any questions you may have about the best oral hygiene practices for your child and what to expect during each stage of development. During most appointments with a cooperative patient, Dr. Feldmanis and our team will perform a dental cleaning, provide fluoride therapy, and take any necessary X-rays. However, any and all of these procedures can be delayed to a later visit if your child does not feel comfortable. Dr. Rita Feldmanis, Eugene, OR kids’ dentist, strives to make the first dental visit a positive and exciting experience for every child. To keep our patients relaxed, we use words that have a pleasant, non-frightening tone, and offer kid-friendly explanations of all treatments, terms, and procedures. Our team works hard to create a relaxed and friendly atmosphere that will help you and your child feel right at home. Arrive a few minutes before your appointment to give your child a chance to get comfortable at our office. Get your child ready and excited to meet new friends. Share your own positive stories of visiting the dentist as a child. Send a friend or family member in your place to the first appointment. Not only would our staff love to meet you, but your child might not feel comfortable without a parent present. Make promises you can’t keep, such as telling your child that the appointment “won’t hurt” or “won’t take very long.” Instead of comforting a child, these types of phrases only reinforce the notion that visiting the dentist will hurt or it will take a long time. Share traumatic stories about visiting the dentist as a child. 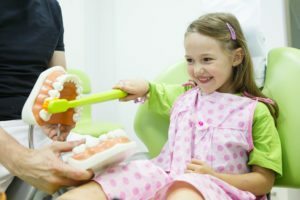 While you might think this will help you to better relate to your child’s experience, it once again reinforces that idea that visiting a kids’ dentist in Eugene is something to be afraid of.